Editor’s note: NYC cheese consultant Raymond Hook chatted with Jill Giacomini Basch, Karen Giacomini Howard, Diana Giacomini Hagan and Lynn Giacomini Stray from wildly successful Point Reyes Farmstead Cheese. Based in northern California, this family-owned company has inspired American consumers and dairies alike. This is part 1 of 2 in a series. Raymond Hook: How long has Point Reyes Farmstead Cheese been in business, what is the history of the family farm? Jill Giacomini Basch: We launched with our first vat of Original Blue on August 1, 2000. We went to market the following January by introducing the cheese at the winter National Association for the Specialty Food Trade show in San Francisco. In February, one month later, we went national with Whole Foods Market. It has definitely been a wild ride to say the least! Raymond Hook: Tell us about your farm and the cows. Karen Giacomini Howard: We milk about 330 cows and have another 300-400 at any given time that are being raised on the farm. We operate on a closed-herd basis, meaning that we only grow our herd through birth on the property. Our cows are pasture-grazed about 6 months of the year on the hills overlooking Tomales Bay and the Pacific Ocean. Our entire farm is certified Organic. The primary component of the cows’ diet during the dry season is cut silage, which we harvest on the farm every spring. It is important to us that the flavors in the milk represent our land and climate year round. The flavors in our milk are truly what makes our cheese so special and so unique. Raymond Hook: Please talk about the importance of being farmstead. Lynn Giacomini Stray: Farmstead isn’t just marketing jargon to our family –- it is without a doubt our #1 core value. In addition to the obvious and important benefit of having total control over our primary raw ingredient, THE MILK (thus ensuring total quality of the cheese), being farmstead is the vehicle which enables successful sustainability on the farm. • We house many of our employees to reduce commutes and ease the burden of the California cost of living. These are just some of the examples of why being farmstead is truly the backbone of our business model. Raymond Hook: When did the sisters take over? How did this happen? Jill Giacomini Basch: Our parents (Bob and Dean) purchased our farm in 1959 and for the first 40 years, they ran the dairy and sold all the milk to our local creamery processor. It had always been our Dad’s dream to produce a finished product that he could sell direct to consumers himself –- he just never had the time or resources to do it. We [the sisters] came back to the farm in the late ‘90s to bring his vision to life. At first we thought we were writing a small business plan for him to take on a new cheese making “hobby”, but soon thereafter we realized that we had a viable business opportunity that could be developed on a national scale – we were up for the challenge and went for it! 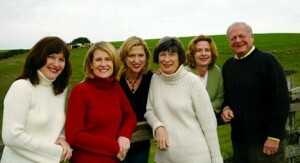 Raymond Hook: There are four sisters who co-manage Point Reyes Farmstead Cheese. What are the upsides and downsides to this arrangement? What happens when there is a major disagreement? Lynn Giacomini Stray: We have very clearly defined roles and responsibilities, which allows us to succeed in our own areas of expertise. While conflicts do arise, they typically don’t pertain to the goals, rather more about which path is best for achieving those goals. We’re very careful with strategic planning, so usually we’re all on board by the time a decision is made. Raymond Hook: Are the managing partners grooming any family members to continue the business? Diane Giacomini: They’re a little young currently, but we’re keeping our fingers crossed! Next week brings part 2 in this interview series. Point Reyes Farmstead Blue Cheese made Raymond’s list of best cheeses found at the grocery store. Great interview by and from some of my favorite people in the cheese biz.